منصوریان, احمد, قدیم, عقیل, قدیم, رضا, روحانی, مهرسا. (1397). ارزیابی تاثیر مواد یخ‌زدا بر حساسیت رطوبتی و مقاومت شکست نمونه‌های آسفالتی در دمای پایین. پژوهشنامه حمل و نقل, 15(4), 285-297. احمد منصوریان; عقیل قدیم; رضا قدیم; مهرسا روحانی. "ارزیابی تاثیر مواد یخ‌زدا بر حساسیت رطوبتی و مقاومت شکست نمونه‌های آسفالتی در دمای پایین". پژوهشنامه حمل و نقل, 15, 4, 1397, 285-297. منصوریان, احمد, قدیم, عقیل, قدیم, رضا, روحانی, مهرسا. (1397). 'ارزیابی تاثیر مواد یخ‌زدا بر حساسیت رطوبتی و مقاومت شکست نمونه‌های آسفالتی در دمای پایین', پژوهشنامه حمل و نقل, 15(4), pp. 285-297. منصوریان, احمد, قدیم, عقیل, قدیم, رضا, روحانی, مهرسا. ارزیابی تاثیر مواد یخ‌زدا بر حساسیت رطوبتی و مقاومت شکست نمونه‌های آسفالتی در دمای پایین. 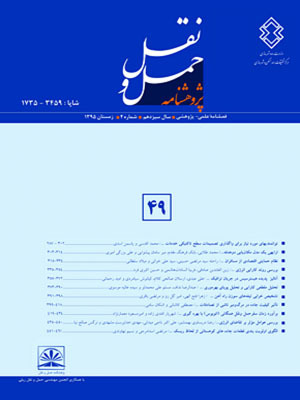 پژوهشنامه حمل و نقل, 1397; 15(4): 285-297. می­تواند متفاوت باشد، به­طوری که در دمای صفردرجه سانتی­گراد­، اثر مخرب مواد یخ­زدا روی چقرمگی شکست مخلوط آسفالتی مشاهده نگردید، در صورتی که در دماهای 10- درجه سانتی­گراد­ یا 20- درجه سانتی گراد برخی از این مواد منجر به کاهش چقرمگی شکست مخلوط­های آسفالتی شدند. همچنین نتایج آزمایش حساسیت رطوبتی نشان داد مواد مذکور اثر مخربی روی حساسیت رطوبتی مخلوط آسفالتی ندارند. Selection of appropriate pavements deicing materials is one of the main concerns of roads maintenance officials. Investigations show that many researches have been carried out on effects of deicing/anti-icing materials on concrete, however a few researches have evaluated the effects of these materials on asphalt mixtures and these few researches have generally concentrated on moisture susceptibility of asphalt mixtures. In the current study, asphalt mixtures specimens were compacted by gyratory compactor and then were cut into semi-circular specimens. Each of specimens was subjected to water and sodium chloride (NaCl), calcium chloride (CaCl2), calcium magnesium chloride (CMA) and potassium acetate (KA) solutions. Fracture toughness of specimens was measured at three temperatures of 0, -10 and -20 °C using semi-circular bending (SCB) specimen test. Tests results showed that the effects of deicing materials on fracture toughness of asphalt mixture specimens were different at three temperatures. At the temperature of 0 °C, the destructive effect of deicing materials on the fracture toughness of the asphalt mixtures was not observed, while at the temperatures of -10 °C or -20 °C, some of deicing materials could decrease the fracture toughness of the asphalt mixtures. Meanwhile the moisture susceptibility tests results indicated that the deicing materials had no destructive effect on the moisture susceptibility of the asphalt mixtures. -Blackburn, R.R., (2004), “Snow and ice control: Guidelines for materials and methods”, Vol. 526, Transportation Research Board. -Christensen, D., Mallela, J., Hein, D. Kalberer, E., Farrar, M., Bonaquist, R., (2010), “Effect of deicing and anti-icing chemicals on HMA airfield runways”, Worldwide Airport Technology Transfer Conference, Federal Aviation AdministrationAmerican, Association of Airport Executives. -Leahy, R., Yang, S.S.S., Vargas, A. and Schmalzer, P., (2014), “Effects of Deicing/Anti Icing Chemicals (DIAICs) on Rubberized Asphalt Pavements”, Federal Highway Administration, Report No. FHWA-AZ-14-617. -McCrum R.L. (1989), “Corrosion evaluation of Calcium Magnesium Acetate (CMA), salt (NaCl), and CMA/Salt solutions”, Michigan Department of Transportation. -National Cooperative Highway Research program (NCHRP). (2007), “Guidelines for the Selection of Snow and Ice Control Materials to Mitigate Environmental Impacts”. NCHRP Report 577, Richmond, BC. - Shi X., (2008), “Impact of airport pavement deicing products on aircraft and airfield infrastructure”, ACRP Synthesis 6, Airport Cooperative Research Program, Transportation Research Board, National Academies, Washington, DC. anti-icing and deicing compounds using sodium chloride and magnesium chloride as baseline deicers–Phase I”, Colorado Department of Transportation Dtd Applied Research and Innovation Branch. -Yang, Z., Zhang, Y. and Shi, X., (2018), “Impact of nanoclay and carbon microfiber in combating the deterioration of asphalt concrete by non-chloride deicers”, Construction and Building Materials, 160, pp.514-525. -Hassan, Y., Abd El Halim, A.O., Razaqpur, A.G., Bekheet, W. and Farha, M.H., (2002), “Effects of runway deicers on pavement materials and mixes: comparison with road salt”, Journal of Transportation Engineering, 128(4), pp.385-391.